Alongside SSL 10, another major offline tournament has arrived on the scene. Featuring the most prominent players active today and substantial prize money, the inaugural HungryApp Starz League with Kongdoo, or Kongdoo Starz League (KSL) for short, welcomes the Brood War community to the new year with the opening round of 16 on January 3, 2015. 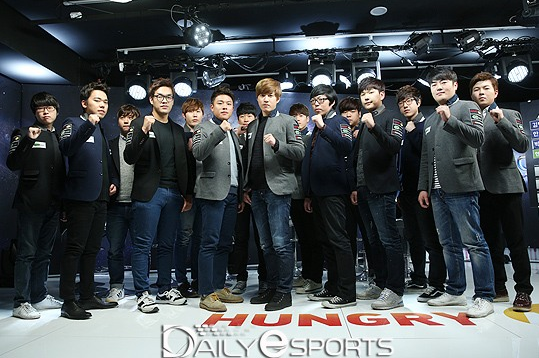 With the likes of Bisu, Sea, and more, the KSL will be broadcast on the HungryApp streaming channel as organized by Kongdoo, YellOw's influential e-Sports management agency. Read on to learn more about Kongdoo and the organization of the Starz League, all the happenings at the group selection ceremony, the two new maps and Ro16 format, and what to expect in the round of 16. 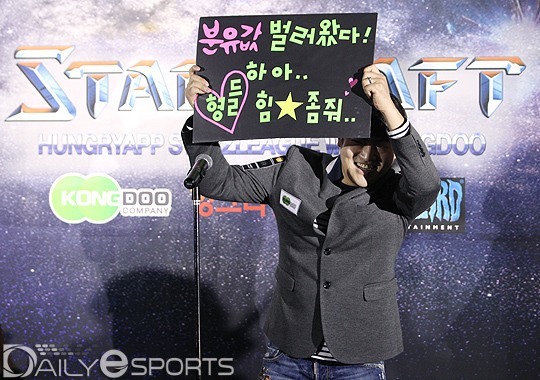 Hosting a Starleague was YellOw's wish since his progaming days. He was aiming to operate one when he retired but back then he had little influence. After becoming more popular through his broadcasting activities, he teamed up with Monsterzym to host his pilot event, the nostalgic and well received StarCraft: Final Four. Shortly after the successful event, Yellow joined forces with an enthusiastic StarCraft fan and programmer (not a typo!) by the name of Lee Doo Hee whom he met through a show called The Genius. Seeing that over 80% of retired progamers end up streaming on Afreeca and that there is more hunger for Brood War among the fans than Sonic alone can hope to alleviate, the two friends founded a new an e-Sports management agency called Kongdoo in March, 2014; 'Kong' of course coming from YellOw's famous nickname and 'Doo' from Lee Doo Hee's name. Meanwhile, having first-hand experience with the stress that comes with retirement, YellOw's long time friend and former MBCGame HERO progamer Shark was acting solo and contracting retired progamers for his broadcasts and to help them get over the difficult and uncertain stage in their lives. Seeing the two parties shared similar goals, Shark was soon enough invited to join Kongdoo. Kongdoo's office is currently situated in a western district of Seoul called Songpa-gu and its core consists of at least seven full-time employed people. The company offers management services and support for both active and retired progamers. Most notably, Kongdoo advertises Afreeca streamers and produces gaming events. In the center of Kongdoo is YellOw as the senior CEO, Shark takes care of production planning and contracting players while Lee Doo Hee develops Kongdoo's webpage and solves technical difficulties and logistics. Among the active Afreeca streamers contracted by Kongdoo are: Mong, HiyA, Killer, hero, ZerO, Pusan, Bisu, Sea, Jaehoon and Movie. The only active progamer contracted is Jaedong. Besides promoting players and supporting them financially in times of need, the agency also helps them generate alternative means of income, as evidenced in Bisu's recent dubbing and photoshoot for a mobile game facilitated by the agency. Besides supporting players, Kongdoo also oversees the players and makes sure they don't step out of the line. For example, after Jaehoon was caught stream cheating, he was taken from Kongdoo's page for a period of time. StarCue was also previously punished and according to Shark, this troublemaker category also included Sea and Pusan, without revealing specifics. 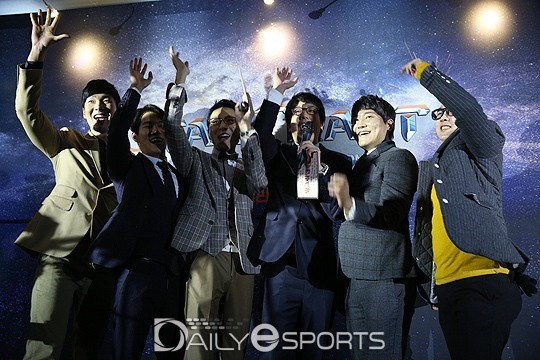 With the company all set, Kongdoo Starz Party aka Final Six, the second nostalgic themed event featuring Yellow, Nal_rA, Silent_Control, ChoJJa, RainBOw and Sync, arrived some four months later and this time without Monsterzym who were busy preparing for another esports league. With the only two other possibilities being SPOTV and OGN, the event was broadcasted on OGN which received the idea positively. The third and by far the biggest event was the spectacular PLU 2014 Starz Party in China, a joint Sino-Korean festival dedicated to Brood War. Co-hosted with the Chinese PLU gaming community, over $114 000 were spent on the event, with the Chinese refusing to air any advertisment or promote any sponsors. Having recently cooperated with HungryApp, a company specialized in mobile game development and broadcasting, on the HEL Special Matches, Kongdoo decided to prolong the collaboration by working together to stream the monstrous event live from Shanghai. Our trip ends after three months of silent preparations with Kongdoo announcing their first Starleague held jointly together with HungryApp's broadcasting team. With Sonic's SSL larger in scale and aired on OnGameNet, the OSL/MSL analogy was only solidified when a casting team composed solely of former MBCGame commentators was announced for the KSL. The following two teams will rotate: caster Kim Chul Min joined by Yoo Dae Hyun and Shark for commentary and caster Park Sang Hyun with Lee Seung Won and IntoTheRain. As for Terror, who was originally supposed to be playing in the Starleague but was replaced on short notice by Kwanro, the official statement merely says he couldn't attend group selection due to scheduling problems. The fact that Terror has become a father on the very day probably played a part in this decision but whether his daughter's birth is all there was to it will likely remain in the domain of speculations considering Kwanro couldn't attend the group selection either. Awaken my child, and embrace the glory that is Brood War. Finally, after two rounds of public contest, the two stargirl positions were filled by the beautiful racing model Cheon Bo Yong which may you remember from 9th Sonic Starleague and a new face in singer Ah Yool (Park Seohwi, girl group LGP) who not only also has previous experience with moderating esport events but even has some first-hand experience, having participated as a Protoss in a female StarCraft 2 league. The group selection ceremony played out on December 27th. The night started off with each player getting a chance to introduce themselves to the audience followed by a quick question from the commentators. The fans got to choose who they thought would win KSL then the group selection ceremony took place. Just like MSL, players got to make their own groups with the leading player allowed to make a single swap after groups were made. First up was Mind who stated that he changed his style and is going to try his best. Free's mindset revolved around enjoyment which fell in line with Rock, the hanbang toss, who showed interest in being an entertainer for the fans by giving us quite the laugh with his own opening act. All this while holding up his own movie star dream in the process! PianO played the modesty card by saying that his own skills are in the middle of the progamer pack while Teacher Movie stunned the commentators with his amazing English language by saying hi! Truly fascinating how helpful a speech academy can be! hero kept his silence only commenting that things are looking a bit better for Zergs when asked. Mong followed his example only stating Mong Hwaiting while Jaehoon refused to give up the player's name who he feared keeping it a secret. In contrast, Hiya made a shocking revelation, that his own girlfriend does not believe he can win KSL so no expectations at all! Pusan showed us a fan sign made by wife claiming his goal is the Ro8. He also went on to claim that the reason he lost his recent game against Bisu was due to his wife watching him! Then it happened! Patriotic Sea came in! With the South Korean anthem playing in the background, Sea declared that he's angry at himself for losing a recent finals to Pusan after preparing for it. He was in it to win it! Killer decided on a fresh start disposing off all his gear with his goal of making the Ro4. ZerO showed his baller status by stating that he does not concern himself with looks when asked by commentators how he still looks the same despite being 27 years old now. Larva, showing his confident side, revealed his previous interest in gambling but decided against it to avoid criticism. However, he'll be willing to gamble for us all. He wanted Bisu! 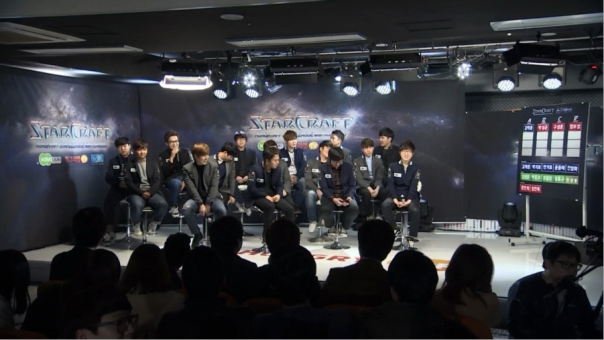 On the other hand, Bisu stated that he didn't know who to pick though Larva was not on his mind. He also indirectly agreed with the comment that he's naturally skilled which is why he's able to keep up despite practicing less these days. With Terror having scheduling problems, Kwanro took his place as the last player however he was not in the vicinity and was contacted later in the night. With player introductions finished, the fans got to voice their favorite to win the KSL with Bisu coming in first place and Rock, in last place, with a grand total of 1 contributed by a lady fan in the audience. Bisu was the first to pick for Group A. Despite being touched by Larva's wish for battle, Bisu chose the Rock ignoring Movie's offer, that he'll knock out the other two players so that both him and Bisu advance. When it came Rock's turn to pick, everyone wanted to join the group since he was considered an easy player (i.e. tasty food). Pusan went on to call Rock a trashy/easy player and got his wish to join the group though he also stated that he didn't want any Zergs in the group! To ensure his advancement after Bisu, Pusan picked PianO stating that he doesn't care about anyone else. Despite being stuck in the worst group possible, PianO showed his confidence by stating that he doesn't care whose is in the group. In Group B, Mind wanted to exact some revenge on well known Afreeca broadcasters so he chose Larva as his first victim. Larva, after deducing that Terran players picked Zergs because they are considered as freebies, decided to mix things up and picked Free who he considered a freebie despite the skill difference between them during their progamer days (Free never did dishes while Larva did for two years). He was confident that he'll advance in first place since the two players will just duke it out. After consulting his group and considering his desire of wanting to play against a strong player, Free went on to pick Mong to complete the group. Things took an interesting turn in Group C as Hiya picked hero so that he can 'share a meal with him'. Many started speculating as to the history of these two though hero saw the positive side of this, an opportunity to advance in first place if he managed to get more Protosses in the group to knock Hiya out. Considering his best matchup, ZvP, hero decided to pick a Protoss eying both Movie and Jaehoon who tried to out-bribe each other to avoid getting picked. Jaehoon started off with 2 meals which was upped to 4 meals by Movie. Having no money, Jaehoon said that he would pay hero's transportation fees while Movie stated that he will definitely win if he is picked. Such scare tactics! In the end, Movie prevailed as hero ended up choosing Jaehoon opting for the 4 cheap (1000 won) kimbap meals and avoiding Movie who he considered scarier. With only two players left, Killer and ZerO, Jaehoon decided to chose ZerO because Killer is his sleeping buddy! 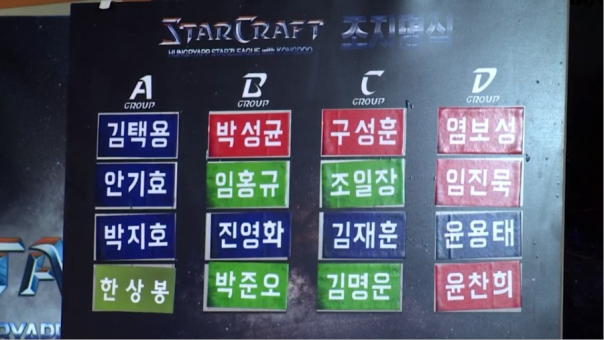 In Group D, Sea wasted no time in picking another Zerg, Kwanro, because he was not present. When asked about why he didn't bother to pick Pusan, Sea said that Pusan is good at PvT and that Sea has lost to Pusan even after that final spoken about earlier so he held the psychological advantage. Right before Kwanro was called, PianO, Mong, Movie and Killer all expressed interest in being chosen. Movie even offered to buy him a meal with the money he will make advancing over him while Mong tried to reassure Kwanro by telling him that he'll take it easy on him. ZerO was the only player who did not want to be picked due to past proleague trauma. In the end, Kwanro picked Movie stating that he wanted 100% insurance from Bisu that he'll be swapped into group A. The fourth player ended up being Killer since no other player was left. With the groups finished, now to the fun part, the swaps! Both Mong and Larva started by saying that Group D was easy and wanted a swap into it but after Mind from Group B stated that he won't counter-swap, Larva's plan was revealed and he backed out. Sea went on to swap Mong out of group B with Killer in group D. For Group C, Hiya decided to just keep the group as is. In group B, Mind contemplated his choices and decided to swap Free for Movie to punish Larva. The poor Zerg could not get a break tonight as it also seems that both Sea and Movie had plans to bring him to Group D to knock him out but Larva was not concerned with facing Protoss players. Now, it was time for the final swap by Bisu. This was the one swap that can offset the balance of all groups! Larva chimed in first offering to wash dishes and provide transportation for Bisu if he was swapped for PianO. PianO stated that he liked that the group had only Protoss players though he would not mind it if he was switched for Movie. Rock was against having another Protoss player because who wants to watch that many PvPs? Pusan also did not want another Protoss player because it ruins broadcasts, go figure! With Bisu still contemplating his choices, PianO added that he does not want to be swapped with Kwanro however Bisu had other plans as he destroyed everyone's dreams and gave himself the easiest group by switching Kwanro in for PianO. With this move, PianO and Larva both got royally screwed ending up or staying in groups where they have a higher chance of elimination! The Starz League organizers have opted for a mix of new and old for the map selection. These were Fighting Spirit, Circuit Breaker, La Mancha, Demian, and Avalon, thus representing one map each from five different tilesets. The old includes Fighting Spirit and Circuit Breaker, two of the most commonly played maps in the current post-KeSPA scene and likely familiar to most readers. Alongside, La Mancha is in many ways a desert tileset version of Fighting Spirit, with their largely shared expansion locations and elevations, similar number and position of choke points, and shared vulnerability of mineral lines. Demian and Avalon are the two new maps in the Starz League, with further discussion below. The round of 16 format is most likely a round-robin format, with best-of-one matches, as indicated by the six dates, or three games per player, scheduled for the group stage and based on the English interpretation of the Korean terminology used. The order of maps to be played was selected by random draw at the group selection ceremony. With their opponents and maps known ahead of time, it will be interesting to see how players prepare for and approach each best-of-one match. Demian, a 128x128 badlands tileset, is in in many ways a three-player version of familiar maps like Lost Temple or Fighting Spirit. The main and natural are located on two elevations and are interconnected by a small ramp. 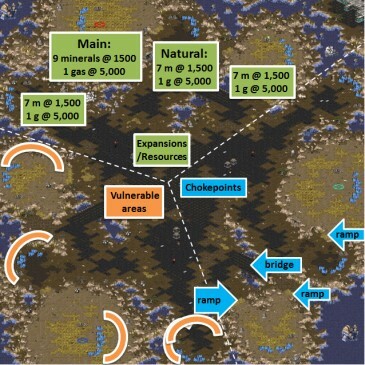 The third expansion is elevated and connected to the rest of the map via two ramps and located just beyond the natural, like Fighting Spirit. Meanwhile, a fourth is nestled between cliffs of the main base and a neighboring elevated base, similar to Lost Temple. The main bases, particularly at 5 and 11 o'clock, feature exposed mineral lines that are open to opponent air harassment as well as drop attacks; at the same time, these mineral lines feature large spaces behind them that enable substantial room for anti-air defense structures like photon cannons or turrets. The 3 o'clock starting position, however, features a less vulnerable mineral line with minimal space behind it; concurrently, the left hand side of the main is exposed, where buildings and infrastructure are rendered vulnerable to ranged units as well as drop attacks, including units being elevator'ed from the lower ground. The third expansions at 1, 5, and 9 o'clock are the most exposed to to attack with a wide ramp connecting them to the lower ground. Meanwhile, all three are on higher elevation and vulnerable to ranged air attacks from the neighboring lower ground, although their mineral lines are just out of range from ranged ground units like siege tanks. Finally, the fourth expansion located counter-clockwise of each main base is seemingly easier to defend; although it is located farther from the main base than the third, it features only one choke point connecting it to the remaining lower ground. Altogether, like many three-player maps, the three positions and territories are somewhat asymmetric, with some regions being easier to defend than others. Progamers should become easily familiarized with Demian as it being so similar to maps like the aforementioned Fighting Spirit, as well as not featuring too many peculiarities. 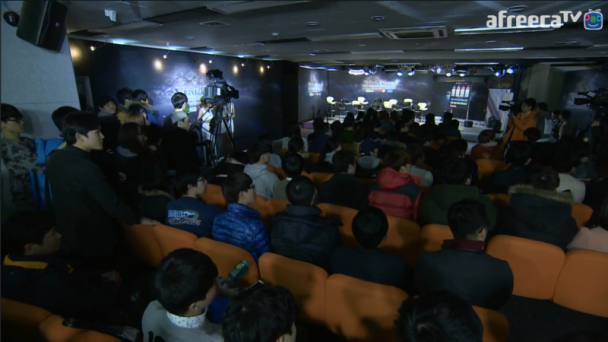 The large flat center battle ground likely favor Protoss in PvT and bio Zerg in TvZ. The multiple expansion opportunities likely favor Protoss in PvT and Zerg in the TvZ match-up, but the third and fourth are farther away from the main base than on FS, so they may very well be more difficult to defend, providing a risk versus reward decision for aggressively expanding players looking to macro. Siege tanks and harassing mutalisks will likely benefit from the many cliffs, combined with moderate to narrow choke points in several locations; thus Terran will be favored in a Terran mech TvZ and Terran in TvP in battles at these locations. Overall, the map features are likely not substantial enough to cause significant imbalances. Avalon brings us a 128x128 ice map, a rare tileset in the current competitive scene. Although Avalon's configuration of bases and wide use of ramps does not quite resemble any of the commonly played maps, its four starting positions in the four corners surrounded by expansion sites with a large flat center area will be familiar to most progamers and fans. 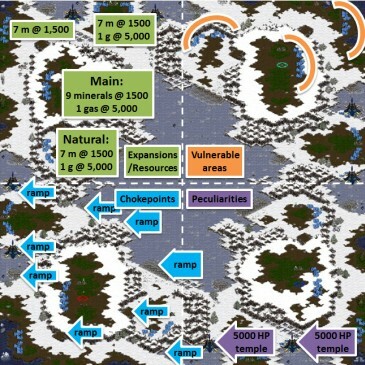 Notable features include a perimeter of interconnected expansion sites, only separated by a series of the Xel'Naga Temple (5000 HP), including a mineral-only third located behind the main base. These temples are reminiscent of those in Neo Electric Circuit, a commonly-played map in the current era, where temples also serve to impeded movement through a ramp of a potential expansion site. Even without destroying the temples, these nested expansion sites are sufficiently vulnerable to attack as they are quite open to the center battleground, with only a ramp choke point slowing down opponents and reinforcements. The expansion sites located behind each main base is reminiscent of maps such as Return of the King or Gorky Island, where these expansion are somewhat secluded from land attack, but readily open to air and drop attacks. Furthermore, reinforcements will likely be delayed as unit rally points will likely be near the natural expansion, which is located relatively far from this mineral only expansion. Notably, the presence of such bases behind the main causes these main bases to feature substantial space behind the mineral lines which, while enable air attack or drop harass, also provide much land for anti-air defense structures. Interestingly, the map features a large number of ramps to separate the three elevations, thus constricting ground troops in many instances. As such, ranged air attacks, particularly carriers and guardians, will likely have an advantage on Avalon, particularly if they can be aptly controlled. The many narrow ramps, however, will likely favor siege tank play, on both offense and defense in both TvP and mech TvZ, but will be advantageous to lurker defenses in ZvP and against bio Terran. Overall, the map features are likely not substantial enough to cause significant imbalances. Bisu versus Rock will be leading the charge as the KSL goes underway. Bisu has a ridiculous PvP record since the Sonic era has begun. This is quite surprising considering how weak he was at the end of the KeSPA era. Now he must take on the enigma of the entire tournament, Rock. Rock got his nickname for Dwayne “The Rock” Johnson and entertains Starcraft fans equally as much. With such grand accomplishments such as his winning record against Jaedong, a victory in the first game will surely be enough to shock the world. Pusan versus Kwanro will be the following day. It’s a twelve year veteran pitted against the most successful cheeser in the current pool of progamers. Let’s be real, we all know Flash was the most successful cheeser of the KeSPA era. Kwanro definitely has a huge advantage though. Having two new maps in added to the pool will allow him the opportunity to discover new exploits he can utilize on his opponent. Even if Pusan and Kwanro have a straight up game the victor would be hard to predict. You can send 1 face-up Spell/Trap Card you control to the Graveyard to target 1 Level 4 or lower Insect-Type monster in your Graveyard; Special Summon that target in face-up Defense Position. The effect of "Beetron" can only be used once per turn. When this card is destroyed and sent to Graveyard as result of Battle, destroy all face-up monsters on the field outside of Earth attribute monster. Activate by Tributing 1 face-up Attack Position level 2 or lower monster you control. Return all face-up level 7 or higher monsters on the field that were Special Summoned to their respective hands. Group B opens up with Mind versus Larva. Mind should play to his strengths and prepare heavily for TvZ. His high win rate versus Zerg should pay off here as Larva and Killer will most likely play straight up games versus Mind. Larva on the other hand may be the most loved player of the new Brood War era. Larva also once believed he was a cat after surviving a fall from a two story building. In order to advance, Larva should focus on aggression. Larva is a top four player on the Fish server. He has the talent to take down the three titans he's been paired against. Larva looks his best when he goes for aggressive strategies and is constantly attacking (JulyZerg style). It is important he prevents any of these players from feeling comfortable in the game.In the end, a win here doesn’t mean the road gets any easier. Movie and Killer face off on Sunday. Removing Bisu from the picture, Movie has been by far the best protoss on the scene. He has taken high results in numerous tournaments since the Sonic era. Movie's Protoss reign is now challenged by Snow and Bisu. Winning out this group will surely mark his resurgence. As the second most successful player of the last two years, Killer has finally grown out of the title "minidong" and gone full "dong". Representing seven golds and seven Silvers in that time period, this is Killer's only tournament remaining. Killer must win if he hopes to start the 2015 year with yet another medal. Mind has proven that his skill is climbing and so are his results each tournament. Movie and Killer have not been impressive for quite sometime. For Movie, Taking a third base in PvZ is a must. Both Killer and Larva will pound at the natural until Movie crumbles. Using either reavers effectively or defensive Sair/DT, if Movie can secure a third base his macro will take him to victory.Meanwhile Killer must embrace the inner dong. Seriously, Killer needs to remind himself that he is the scariest player in the group. Confidence and mental preperation is what's most important as his tournament life is on the line, Larva is the underdog of this group. Unfortunately I won't be predicting this underdog. When a monster would be Normal or Special Summoned, OR a Spell/Trap Card is activated: Tribute 1 Psychic-Type monster; negate the Summon or activation, and if you do, destroy that card. If this face-up card is targeted for an attack: You take no battle damage for the rest of this turn. When this card is destroyed by battle and sent to the Graveyard: you can Special Summon 1 "Cyber Larva" from your Deck. *While in Attack Position: This card gains 800 ATK for each Equip Card equipped to it. *While in Defense Position: This card gains 800 DEF for each Equip Card equipped to it. A huge bee with exceptional strength that''s particularly dangerous in a swarm. Group C might pose the best games of this round of 16. Hiya versus Hero should be game of the night. Known as the Fish King, HiyA has recently slain the brother of the dark prince, Bisu, in a best of 5. HiyA is fresh out of his slumber sporting three golds and one bronze in 2014 and looks to challenge the title of best Terran, which is currently up in the air.While Hiya should expect a victory to start the group off, things aren’t over for hero. hero may be a ZvP specialist, but hero was also close to becoming the #1 player world wide. However, his terrible record against Terran and Zerg caught up to him in tournamet boX series. Still, with 6 silvers and 2 bronze medals, hero had a very succesful 2014 and looks to exhibit consistency going into 2015. Jaehoon versus Zero will resume games for this group on Sunday. Did you know Jaehoon already has earned a gold in 2014? 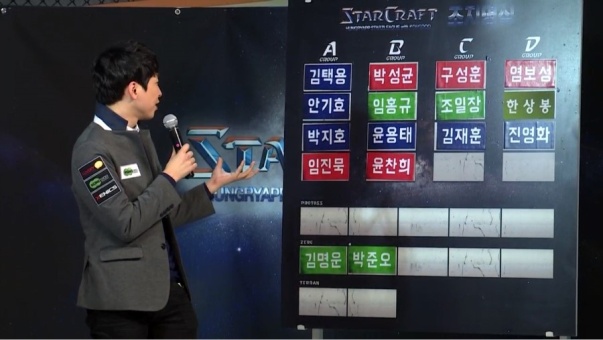 In the 2014 HoSic BJ Starleague, Jaehoon went 3-1 against HiyA and 15-6 against Protoss opponents. Let's just say group A is very lucky to not have him. On the other hand, Zero is yet another player who wishes they landed in group A. ZerO was very consistent when playing for Woongjin Stars. Lately, it is ZerO's vP that keeps him alive. Winning the Zeus BJ Starleague was a very nice accomplishment for him being so fresh on the scene. 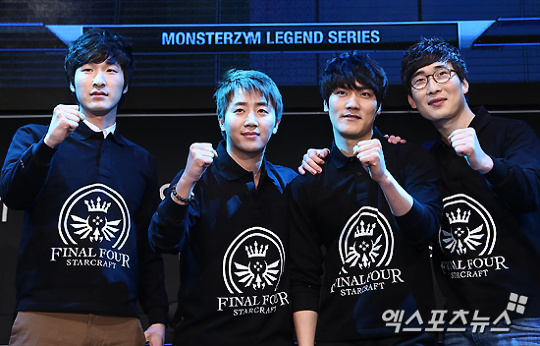 ZerO looks to return as a top three Zerg in 2015. Hiya's recent success makes him the favorite to advance from this group. With Jaehoon's terrible PvZ, it looks like an epic ZvZ showdown will determine who else advances. Is it time to say hello.ZerO, bye.hero? When this card is Normal Summoned: You can Special Summon 1 Level 4 monster from your hand. If this card is destroyed by battle and sent to the Graveyard, Special Summon 1 Destiny Hero monster from your Graveyard (except a Destiny Hero - Fear Monger) during your next Standby Phase. Roll a six-sided die. If the result is 2, 3 or 4, destroy 1 Spell/Trap Card on the field. If it is 5, destroy 2 Spell/Trap Cards on the field. If it is 1 or 6, you take 1000 damage. Activate when a face-up monster you control is removed from play. The ATK of all face-up monsters on the field becomes 0. The final group is filled with three of the greatest Terrans in the game. The first will kick off with Sea versus Piano. Sea was godlike in 2013 and quietly won two golds and a silver in 2014. The decrease in SRTs might be to blame for this. Ranked third overall in Elo, many question whether Sea is the best in the world or even a top Terran. PianO is in the running for best new Terran this 2014. His strength in TvZ cannot be shown here, but it should make every TvT fan giddy knowing he's in this group with Sea and Mong. The last of this weekends games is between Free and Mong. Free is the silent crusader of this group. Only having to prepare against Terrans would be a gift if it weren't against such great Terran players. Free's best accomplishment of 2014 was going a whole year without calling himself pretty. The cuddliest player(Mong) in the pro scene draws a tough group. TvT has been his weakness for years now. His best tournament run ended in a loss to sSak during the semifinals. Advancing from this group will immediately surmount all his accomplishments of 2014.Mong cannot lose to free. Verus terran he must defend, defend, and defend. Mong needs to deny drops, runbys, and cloaked wraiths at all cost. Winning max army versus max army engagements is his best shot. Playing a turtle style and expanding instead of attacking is the key to success. TvTvTvT round robin we go. Will Free be suffocated out of this group or cause chaos? Will Mong survive the great mech battles of 2015? Statistics say nay and so do I.
FLIP: Both players roll a six-sided die once. The player with the lowest result takes Direct Damage equal to his/her opponent''s result X 500 Life Points. However, if a winner''s result is 6, the loser takes 6000 points of Direct Damage. If the results are the same, both players roll again. 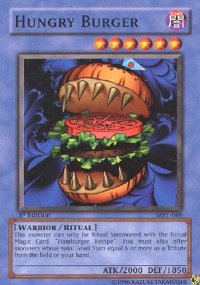 This monster can only be Ritual Summoned with the Ritual Magis Card, Hambueger Recipe. You must also offer monsters whose total Level Stars equal 6 or more as a Tribute from the field or your hand. WOW im speechless, this is beautiful, it is great that its happening, happy new year btw! There's gonna be some sick TvZs here but I'm still looking forward to group D the most. I wanna see a 50 min TvT! I think free has a good shot. He only has to go up vs T, and, well, Piano has struggled in that area. I would bet that group is going to have tiebreakers. I don't see any of them going 3-0. This is LOVE, all LOVE......Amazing picture too! Bisu in the middle makes it all that much better...This is so amazing to see man, makes me have goose bumps!!! I LOVE BW! Really impressed with all the Brood War stuff lately, this is awesome! This is without a doubt the best report I've read on TL in a long time. Thanks for this, and seeing the Rock play again makes me so happy haha. This is LOVE, all LOVE......Amazing picture too! Bisu in the middle makes it all that much better. Very excited for this! I also love the fact that the league is kicking off with Bisu! It's nice to have a reason to get back in to BW! That is a sick writeup, thanks a lot ! Amazing work! And I was afraid you guys wouldn't find enough staff. Avalon has the feel of Outsider. While Demian is 3-player FS. Great writeup, also LOL at the yu-gi-oh cards. Zero force, Killer Needle, Fish Rain and Mind over Matter are the best. Thanks guys!! Beesuit back in the ring, so hyped for this tournament. Love the write up btw. I had no idea about the background of Kongdoo, so thanks for the education.